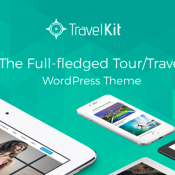 TravelKit is a premium responsive WordPress theme for the tourism sector. If you are in charge of a travel business or agency, TravelKit is the ultimate thing you need to launch a super-functional tour site. The theme is loaded with tons of industry-specific features that will make your site incredibly user-friendly and easily manageable.